The 2010 #1 Draft pick to the Connecticut Sun and WNBA Rookie of the Year and 2012 WNBA MVP, Tina Charles is redefining the standards for rebounding in the league, rewriting the record books while surpassing the records of legendary players on what seems to be a weekly basis. Charles is the fastest player in WNBA history to reach 400, 500, 600, 700, 800, 900, 1,000 and 1,100 career rebounds. Charles owns the top two single-season rebound totals in WNBA history. 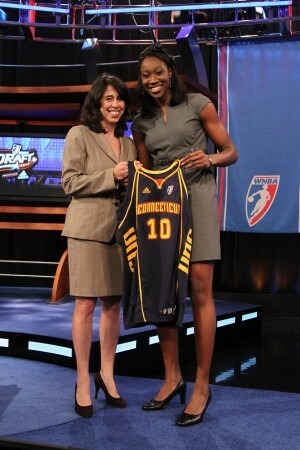 She had 398 rebounds as a rookie in 2010 and 374 in 2011. 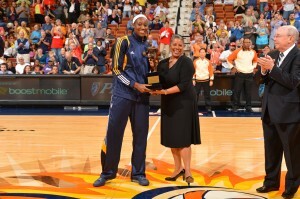 Charles owns the WNBA record for double-doubles in a season with 23 in 2011. She set the previous record with 22 in 2010. Her 63 double-doubles are a franchise career record, and already rank ninth all-time in WNBA history. Charles ranks No. 1 all-time in WNBA history in rebound average (11.1), ahead of Cheryl Ford (9.7), Candace Parker (9.5), Sylvia Fowles (9.4) and Lisa Leslie (9.1). Charles is the only player in WNBA history with three 20-point, 20-rebound games in her career. Chamique Holdsclaw (2) is the only other player in WNBA history to have more than one. Charles has led the league in rebounding three straight years. She has led the Connecticut Sun in scoring and rebounding in each of her first three seasons. Charles set a franchise record by averaging 18 points per game in 2012. She has been named WNBA Player of the Week nine times. Charles is also Gold Medalist. 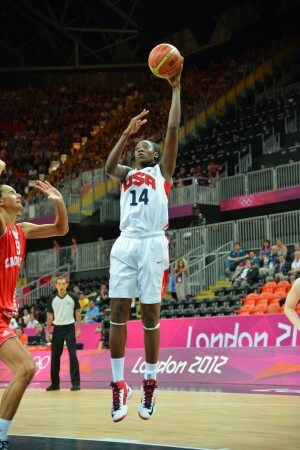 She averaged 10.5 points and 7.4 rebounds as a member of the 2012 USA team that went undefeated at the Summer Olympics in London. 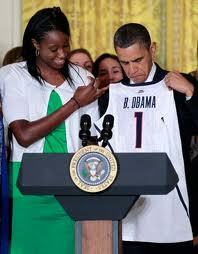 She also helped Team USA go undefeated on the way to Gold at the World Championships in 2010. Charles was the unanimous Player of the Year in college, sweeping the Wooden Award, Naismith Trophy, Associated Press and USBWA honors as a senior at UConn, where she led the Huskies to consecutive undefeated NCAA titles. In high school, led Christ The King, Middle Village,NY to consecutive undefeated state championships. Averaging 26.5 points, 14.8 rebounds and 5.2 blocks her senior year. As a senior in 2006, Charles was the Parade Magazine Player of the Year, Gatorade National Player of the Year, WBCA National Player of the Year, McDonalds Player of the Year, USA Today National Player of the Year and EA Sports National Player of the Year.